The delight of devouring a Chicago-style hot dog on the streets of the Windy City is unparalleled, because let’s be real, it’s impossible to deny the intoxicating combination of a juicy beef frankfurter topped with yellow mustard, chopped onions, relish, tomato slices, pickled sport peppers and a pickle spear, all served on a characteristic poppy seed bun. With so many interesting flavor components ripe for experimentation, the iconic hot dog has piqued the interest of Chicago's hottest chefs. 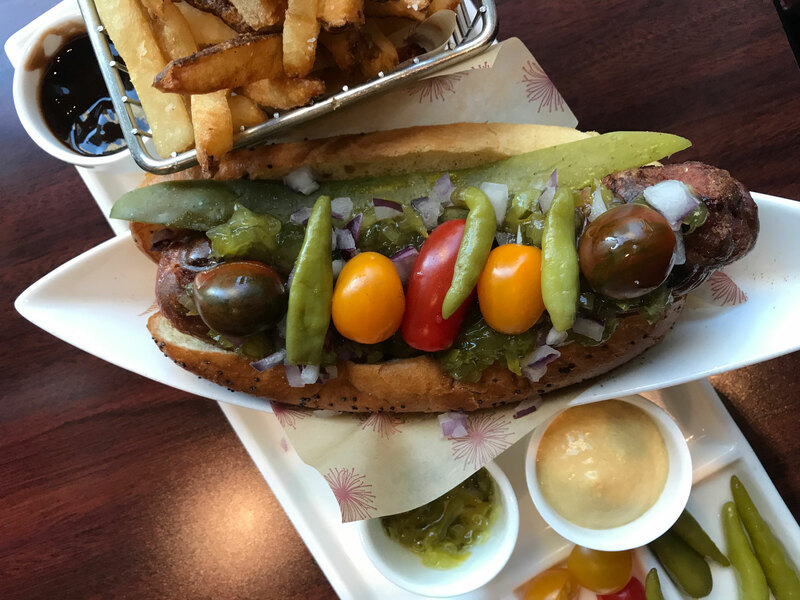 "The Chicago dog is the perfect culinary representation of the city of Chicago, in my opinion,” says chef Abraham Conlon of Fat Rice. “It’s my favorite local staple, above deep dish pizza and Italian beef. It really has a little bit of everything to make a complete meal and is straight up delicious.” You most likely have your favorite spot, but several Chicago chefs are reinventing the famed hot dog in ways that are really worth trying. Chef Mike Simmons moved to Chicago in 1997 without ever having tasted a Chicago-style hot dog, but things quickly escalated after he witnessed the goodness of Byron's Hot Dogs at a Wrigley Field Cubs game. “Out came this bright, colorful, clown car looking hot dog like nothing I’d ever seen,” Simmons says. As one of his all-time favorite bites, Simmons decided to craft up his own version at Cafe Marie-Jeanne—a Chicago-style lobster roll. “My sous chef and I had been talking about Chicago-style hot dogs during a particularly hungover brunch service and the little light came on,” he says. “We smoked lobsters over applewood and hickory, then picked the meat and dressed it in an aioli with lots of smoked paprika, black pepper and a ton of coriander. 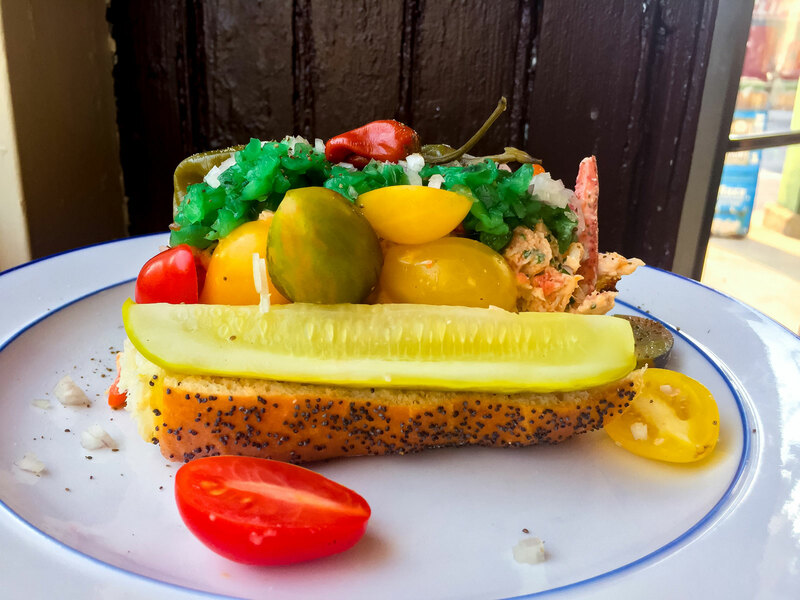 The similarity to hot dog flavor was uncanny.” Its split-top poppy seed brioche roll dressed accordingly with pickled shishito peppers, long cucumber pickle spears, diced onions, green relish and yellow mustard, has become a warm weather alternative to the famous dog. Executive chef Sean Murray is perhaps the fittest chef on the block. Don’t let the fact that he’s an avid boxer and health aficionado turn you away from his mouthwatering creations, as his rendition of the famed Chicago dog is everything. “I enjoy putting healthy twists on traditional favorites, while still maintaining (or improving) the flavor of the food. I wanted to 'lighten up' the hot dog,” Murray says, of the original Chicago Dog option on the menu when he arrived at Four Seasons Chicago. “When I cut back the fat percentage, it allowed the flavor of the beef to shine through,” he adds, and from there, a best-selling masterpiece was born. 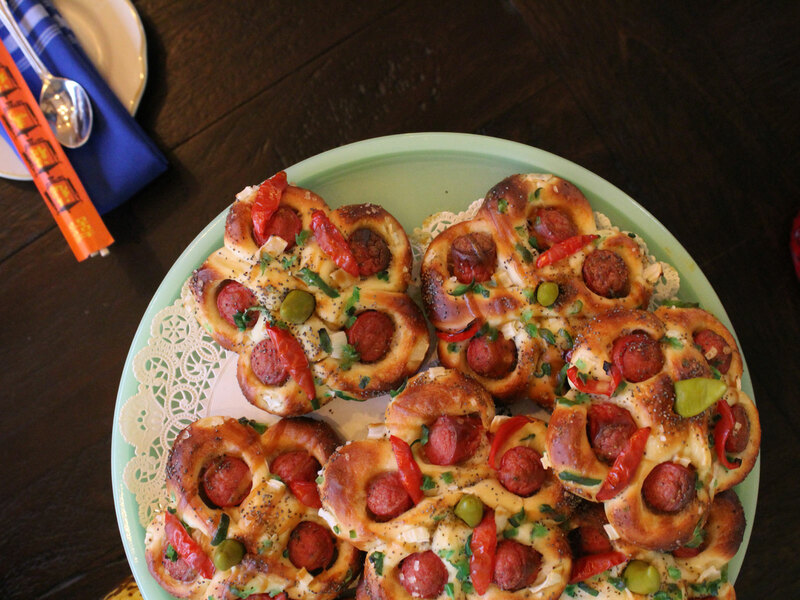 Chef Conlon’s Chicago-style Chinese hot dog bun marries Chinese, Portuguese and Chicago flavors all in one bite. Think a traditional Chinese bun equipped with all the Chicago-style dog fixins, but easier to tear apart and eat at leisure. “At Fat Rice and The Bakery at Fat Rice, we decided to do this variant after we saw versions of hot dog buns in traditional Chinese bakeries,” he says. “Chicagoans are very passionate about their hot dogs and [our version] works because it’s not a deconstructed take on the dish. All of the parts are there, so it’s a fun ‘Chicago approved’ variant on the dog." 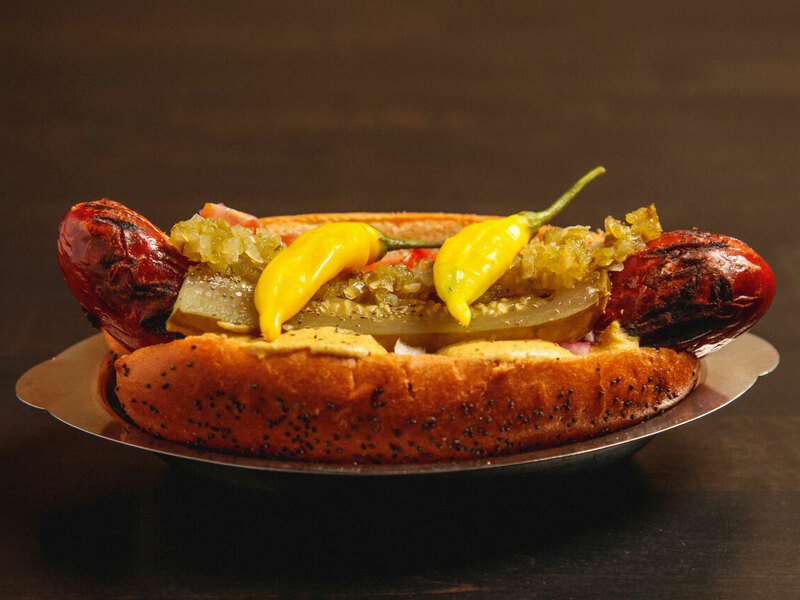 Inspired by childhood afternoons spent waiting in line for the perfect hot dog at famous hot dog stand Gene & Jude’s, chef Bill Kim reinvented the Chicago-style dog “with the hopes to create an exciting Asian version” via several flavorful tweaks. Offered during bellyQ’s happy hour, the all-beef Vienna hot dog is topped with crispy egg noodle, pickled green papaya (like green relish), Korean chili paste (like ketchup) and curry mayo (like mustard) on a New England brioche bun. It’s the crispy egg noodle garnish that really takes it over the top. 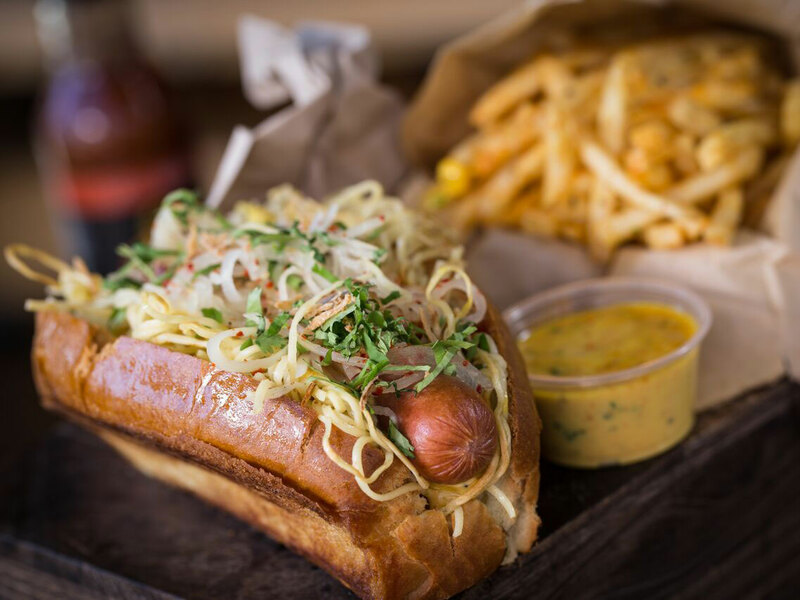 At The Duck Inn, chef Kevin Hickey takes it up a gourmet notch by blending a perfect amount of beef and duck fat in a hog casing to bring hungry diners the Duck Fat Dog, the restaurant’s tribute to a Chicago dog. “We grill it until nicely charred and then top it with all of the classic ingredients made in-house—beer mustard, relish, pickles, pickled hot peppers (which we grow ourselves), onions, tomatoes and celery salt—all on a brioche poppy seed bun,” he says.